I am used to hearing lots of fans cheering for the other team when it's the Subway Series, but at last night's Met game, it was the Dodgers that seemed to be getting bigger cheers than the Mets, at least where Squawker Lisa and I were sitting in field level down the left field line. Perhaps it was because the last-place Mets, punchless at home, trailed almost the entire game. The Dodgers took the lead for good in the second inning, and though it was only 1-0 at the time, the only runs the Mets would score in the first eight innings would come on a two-run homer by Eric Campbell in the sixth, cutting the lead to 3-2. The Mets scored again in the ninth, but the Dodgers had tacked on an insurance run and the Mets lost, 4-3. No, it didn't help that the insurance run was able to score as a result of the Mets botching a potential double play. In the middle of the game, a guy stood in the aisle trying to start a wave. I ignored him the couple of times, then did a half-hearted wave hoping he would move on. He was blocking my view of home plate! But the guy came back a couple more times to try to start more waves. Then I saw him further up the aisle, speaking with some stadium personnel. The wave enthusiast was not dressed as a Mets employee, and for all I know, the employees were telling him to cool it. But when the only noise the sparse crowd is making is for the other team, it's not hard for me to believe that Met officials would try to find some way to get some more noise in the dead ballpark. By the way, Campbell's shot was his first major-league homer. Four years ago, Lisa and I saw another Met first baseman wearing number 29 hit his first major-league homer. Ike Davis is now hitting .286 with two homers, 10 RBI, 13 runs and a .388 on-base percentage in 84 at-bats. Davis probably needed a new start somewhere else, but I don't think it's a coincidence that Sandy Alderson's performance has come under a lot more scrutiny since the Mets received little back in return for Davis. Meanwhile, Stephen Drew just signed with the Red Sox for about $10 million. He may or may not be worth it, but now the Mets are supposedly looking at shortstop prospect Didi Gregorius. Will the Mets try to trade a top pitching prospect for a player who started for the D-Backs last year, but lost his job this spring and is now back in the minors? At least Shake Shack is still going strong. Maybe the Mets should move Shake Shack to behind home plate, to make it look as if there are lots of enthusiastic people at the ballpark. Lisa will be squawking baseball with Mike Lindsley of Syracuse's The Score 1260 at 5:30 p.m. today, Tuesday, May 20. If you are in the Syracuse area, you can listen to her on 1260 AM on the radio. If not, check out the station's web site and listen to her there. Thanks! The Mets swept the Yankees in the Bronx and have now beaten the Bombers six straight. Squawker Lisa is so discombobulated she ended up with tickets to see Joe Torre's number get retired. But it's never a completely sunny day with the Mets. Zack Wheeler couldn't get out of the fifth inning with an 11-4 lead. And there are reports of food poisoning at one of the best things about Citi Field - Shake Shack. The Mets' mantra has been, just wait until all the great young pitchers are up. Never mind that Matt Harvey is recovering from a serious arm injury, and even if most Tommy John patients recover successfully, they often don't fully regain their form right away. In eight starts this season, Wheeler now has a 4.53 ERA, 1.60 WHIP and 24 walks in 41 innings. While I'm looking forward to seeing Rafael Montero tonight and Noah Syndegaard next month, there are of course no guarantees with young pitching. As for Shake Shack, I find it hard to believe that there could be an outbreak of food poisoning at such a popular place and that there would not be many more reports of people getting sick to their stomach. (Unless lots of people are getting sick to their stomach and assumed it's from watching the Mets.) Maybe if it were two people from the same team who may have shared an order, but not a Met (Lucas Duda) and Phillies manager Ryne Sandberg. And now the Mets say that Duda got sick at another Shack Shake location outside Citi Field, which makes the whole story even more outlandish. Two different baseball people at two different Shake Shacks? Something about this story is not adding up for me. Two of the main areas where the Mets are clearly superior to the Yankees are young pitching prospects and stadium food. So I hope Montero does well tonight and thousands of fans continue to enjoy their Shackburgers. And that the Mets become the first team to beat Masahiro Tanaka. Squawker Jon, I hope you haven't gotten carpal tunnel syndrome from writing two blog posts in a row. Funny how you have so much to say when it comes to the Subway Series, especially when your Mets won. Good thing you managed to roust yourself and write once in a while, or I would have to start calling you Subway Snoozer! On the other hand, my Yankee brethren sounded positively quiet when Curtis Granderson came up to the plate. Using their (dopey) logic that was exhibited with their shameful booing of Robinson Cano, the same people should have booed Granderson for not just going to the Mets and getting more money there, but for referring to Mets fans as "true New Yorkers." It just goes to show that the booing of Cano is really because Yankee fans wish he were still with the team. Speaking of Robbie Cano, don't you know, are you aware that the Mariners now have a better record than the Yankees? An aside: I thought about signing your team's dumb petition on true New Yorkerdom so that if I won, I could show that I was a Yankee fan and mock you all. But I didn't want to take a chance of anybody thinking I was a Mets fan -- it would be like having cooties. As for the flashbacks to the Castillo game, the Yankee radio pre-game featured both Sterling's "Oh Wow" call for that, as well as the call when Mariano Rivera got his 500th save (which was against the Mets, of course, at Citi Field.) And we were at both games! Two of my very favorite Yankee-watching moments. Are you still fuming, Jon? How about that Kerosene Kyle? This is what happens when your team loses a gazillion dollars in a Ponzi scheme -- they have him as the closer. Even the Yankees never did that! Unfortunately for me, Farnsworth got out of the jam and got the save. But don't reward him by putting Farnsworth back on your fantasy team, Jon! And yes, the Yankees have a lot of injuries, but 1) that is not an excuse, and 2) that is what happens when you sign old, injury-prone players -- they get injured! I will give your Mets credit for one thing -- their contrasting brims (the orange with the blue hat) look a heck of a lot better than the white brims on the Yankees caps! Good grief. It's been five years since the Luis Castillo game, and it still gives me nightmares. During the ninth inning of last night's Subway Series opener, it was starting to look like deja vu all over again. Five years ago, the Mets let the first game of the Subway Series, 8-7, in the bottom of the ninth. Derek Jeter and Mark Teixeira reached base, A-Rod popped up to Castillo, and I still don't want to think about what happened next. Last night, the Mets led the first game of the Subway Series, 9-7, in the bottom of the ninth. Once again, Jeter and Teixeira reached base. But there would be two crucial differences between 2014 and 2009. In 2009, the game ended when Met infielder Castillo muffed what should have been an easy play. In 2014, the game ended when Met infielder Lucas Duda made a great play on a sharply-hit grounder by Brian McCann, starting and finishing a double play. The other difference was Teixeira's health. In 2009, Teixeira scored the winning run from first because he was hustling all the way when A-Rod hit what looked like a game-ending pop out. But in 2014, a hobbling Teixeira could only make it to first when he hit what should have been a double. Teixeira was immediately removed for a pinch-runner. If Teixeira had made it to second, the tying run would have been in scoring position. Duda would not have been able to get the force at second to start the double play. The inning would have continued after McCann's at bat, and the way Farnsworth was pitching, the Yankees would have had a good chance to give Met fans more nightmares. Instead, the Mets have now beaten the Yankees five straight. Last year, the Mets swept the Yankees in the Subway Series. But this season, the Mets don't have Matt Harvey while the Yankees have Masahiro Tanaka. And the Mets figure to embarrass themselves before the games with the presentation of the ridiculous "true New Yorkers" letter and whatever fawning retirement gift they have for Derek Jeter. 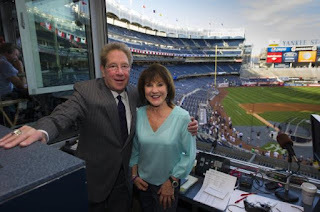 By the way, Squawker Lisa, while Beltran got off to a great start in the Bronx and Granderson was awful in the early going, over the last two weeks Granderson is hitting .308 with two homers, seven RBI and five runs, while Beltran is hitting .147 with no homers, two RBI and three runs. next to just-released 36-year-old Heath Bell. The day before the 2013 Subway Series, the Met rallied for three runs in the eighth inning and broke a five-game losing streak. Yesterday, the Mets rallied for three runs in the ninth and went on to break a five-game losing streak. So here's hoping the Mets can pull off another sweep of the Yankees. Of course, the Mets followed the four-game Subway Series sweep by losing ten of their next twelve. At 17-19, the Mets now have to go 73-53 the rest of the way to win 90 games. Did Mariano Rivera really call the old Yankee Stadium 'a loud and frenzied cauldron of pinstriped passion'? There was a rather spirited discussion on my Facebook page yesterday regarding my Squawk about Mariano Rivera's new book, and about the great Robinson Cano/Dustin Pedroia debate. I also noticed something my friend, popular author Jerome Preisler (see his Amazon page ), said on his own Facebook page. He had gotten to read an e-sampler of "The Closer," and didn't think that Wayne Coffey had captured Rivera's voice. And after reading some of the quotes and an excerpt from the book, I completely agree. Coffey did a great job with R.A. Dickey's book, which is one of the best baseball books I have ever read. This one, not so much, if the quotes show what Mo's book is about. Very disappointing. "It doesn't hold noise, or home-team fervor, anywhere near the way the old place did," he said. "The old Stadium was our 10th man -- a loud and frenzied cauldron of pinstriped passion, with a lot of lifers in the stands. Maybe I'm wrong, but it's hard to see that the new place can ever quite duplicate that." While I mostly agree with the sentiment (but also think that some of the lack of noise is due to the changing fanbase, not just the stadium itself) I don't think for a minute that Rivera said that exact quote. That is sportswriter speak, not real-life speak. Not only does Mo not talk like that, but most people don't. Except for florid sportswriters like Coffey. Not to mention the bizarre digression in the book discussing the greatest second baseman ever. According to the ESPN article about the tome, "Rivera cites Roberto Alomar and former teammate Chuck Knoblauch as second basemen he'd consider alongside Cano in the debate over the best at the position." Knoblauch? Really? Not only was he in the Mitchell Report, but he had to stop being a second basemen in what should have been the prime of his career because he couldn't make the throw to first anymore (Remember when he accidentally hit Keith Olbermann's mother in the stands?) Knoblauch is a sad story, but he doesn't even belong in any part of the discussion of the best second basemen ever. And the fact that Rivera included him makes me question Mo's judgment a little. Anyhow, when a publisher releases information about a book's contents, they should leave you wanting to purchase the book, not leaving you scratching your head why nobody seemed to realize that Mo's "voice" in the book sounds nothing like him. What should be a poignant excerpt -- Rivera talking about his difficult childhood -- is flawed because it just doesn't sound like the way Mo talks. In retrospect, as Jerome and I discussed on Facebook. Rivera and Coffey would have been better taking their time with this book, instead of doing such a rush job. Did they think people would so quickly forget the greatest closer of all time? If they had spent, say, six months to a year more on this, or even just waited for time and perspective before putting pen to paper, they had the material with Rivera's life to make what could have been a great book. Instead, they pushed out a book with groaners like "a loud and frenzied cauldron of pinstriped passion" and fomented controversy for no reason with the stuff on Cano. They should have had more confidence in Rivera's story and given him the type of great book that his career warranted. A dignified one. Mariano Rivera, arguably the most respected player in MLB in recent years, with the most saintly reputation (he's like Tim Tebow but with Hall of Fame talent), is one of the few things Squawker Jon and I agree on. Not only is Mo my favorite player of the 1990s dynasty years, but I have gone to see him speak on Staten Island, and Jon and I went to eat at his restaurant in New Rochelle a few years ago. Squawker Jon also gave him a standing ovation when he saw him pitch at CitiField and at Yankee Stadium in Mo's last season. Rivera is the rare -- make that pretty much the only -- Yankee that Jon can stand. In case you haven't figured it out by now, in addition for rooting for different teams, Squawker Jon and I have very different personalities. Where I am brash and impulsive, Jon is quiet and methodical. But one of the things we do do for each other is try to bring out the best, and stop the worst. When I have an opinion or impulse or idea that Jon thinks is too much, he will simply say, "What does that get you?" -- meaning, is it really worth the aggravation in saying or doing what I want to? Sometimes Jon is right, and sometimes he is wrong in asking that, but it is a good question to ponder before saying or writing something controversial. All this is to say that I wonder why apparently nobody asked Mariano Rivera "What does that get you?" when it comes to his new book, The Closer . Because it seems bizarre to me that he would tarnish his saintly image with some of the things he said in his book, written with Wayne Coffey. Ask yourself this: would Mo have written that if Cano hadn't gone to the Mariners? The answer is that he wouldn't have. And what does writing this get Mo, anyway? It seems more than a little unseemly for him to question somebody else's drive this way, especially when Rivera himself never showed any "red-hot passion" on the field himself. How would he have liked it if people had said the same about him? And since when did Cano become some underachieving schlub, anyway? He not only was the best player on the Yankees for the last half-decade, but he played nearly every game and showed up to the park early nearly every day to work on his game. But the moment he leaves the Yankees, he becomes some bum? To top it off, comparing Cano to Red Sox Pedroia, and finding Cano wanting, is a bit much. Sorry, folks, but Cano IS better than Pedroia. C'mon, Mo, you're better than this. Rivera writes that neither the 2003 team nor the one that lost four straight to the Red Sox in the ALCS a year later was close to having the same championship-quality fiber as the Yankees’ previous championship teams. He isn't the first Yankee to raise that whole "it's not the same team" argument, but it makes me wonder: if the heart of the dynasty team were the players who were no longer on it in the next decade, then what does that say about Rivera and the so-called Core Four? That they weren't really so core? At any rate, I will still be a fan of Mo, but I am very disappointed that he chose to make such comments. In answer to the question "What does that get you? ", I guess it will get him some book sales, but at a cost to his pristine reputation. Not an even trade. Did the Yankee brass turn up the field microphones to amplify the Robinson Cano boos? The Yankees threw some gasoline on this one. No one was there at the game. And, they threw the field mics up to full throttle. When the M’s manager came out to argue with the third base ump late in the game, you could hear every word out of their mouth – until someone starting cursing and then YES lowered the volume on the feed. If YES had their field mic on normal levels, you wouldn’t have heard the Cano reaction in quite the same way. I think Steve's theory is absolutely correct, and I would like to see somebody in the New York media ask the Yankees about this. I was wondering why we could hear the words in Lloyd McClendon's argument so clearly! I am kicking myself for not realizing this earlier. Not that there weren't boos -- I am quite sure that the boos outweighed the cheers by a large margin -- but that the Yankee brass would want to emphasis the anti-Cano boos as much as possible. Good thing this is such a classy organization.